Lunch time book discussion group that meets at Taylor Books. May's meeting will be discussing When The Emperor Was Divine. Meeting is from 12-1 PM at Taylor Books. Space graciously provided by Taylor Books. Book available through Taylor Books. Join host Jay Jacoby for a discussion of BUDDHA IN THE ATTIC by Julie Otsuka. The extraordinary lives of "picture brides," from their arduous journeys by boat, to their arrival in San Francisco and their tremulous first nights as new wives; from their experiences raising children who would later reject their culture and language, to the deracinating arrival of war. 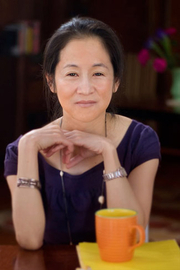 Join featured author Julie Otsuka for the One Book, One Philadelphia kickoff and enjoy an original musical work, inspired by featured selection The Buddha in the Attic, composed by Riho Maimets of the Curtis Institute of Music, as well as a dramatic reading by the Distant Voices Touring Theatre. Julie Otsuka is currently considered a "single author." If one or more works are by a distinct, homonymous authors, go ahead and split the author. Julie Otsuka is composed of 3 names. You can examine and separate out names.